.....yes..and of much greater capacity. That was my point ! ..So why did you suggest it ? But the state is already hundres of MW short on generating capacity, so there is no surplus available ,..let alone for a 5GWh charge ! Duhh ?... I think that gets us back to the original point of this facility...to back up the wind farms irratic supply ! If this thing is intended to often run for 2 days straight then that makes it baseload? Just not a regular one? It's definitely not a peaker and not a load follower as they ramp down at night (less than 24hr usage pattern). Regardless, I struggle to understand why someone would select reciprocating engines for that (and diesel rather than natural gas fuelled, really?!). Maybe they were cheaper based solely on initial purchase. If they need ENERGY, then solar or wind or a CCS gas turbine is a great way to go. If they need POWER to stabilize the grid, then BESS makes more sense. Do you understand the difference between energy and power? So add solar or wind or natural gas. Exactly. It enables cheap energy for consumers. Here in the US, there has been an attempt to define baseload as "plants that can store 90 days of fuel on site." (Note that this means that natural gas plants and large hydro plants are not covered.) If this doesn't make much sense, it's because it was a political effort to save coal fired power plants. Cheaper and faster starting. And if they are needed for very short periods of time the fuel costs aren't huge. Yes, it is politics...."Green" politics to be precise, which have dictated poor energy strategy decisions to eliminate all existing coal power, and commit to RE for "base load". This now means they have to find a way to cope with the huge and unpredictable variations in generation output. No , i did not miss the point. The SA grid needs more POWER (600+MW). for long periods of time ..12+ hrs at a time, often much longer. This new 210MW plant could at least supply 5 GWh per day, not enough but much much more than any concievable BESS . So again bill, ...why suggest a BESS for that situation ? when you have already said its not practical ? ...So add solar or wind or natural gas. I seriously hope you do not mean for recharging the BESS ! And if you mean to make up the generating capacity shortage, then think again about solar or wind , and why they have the shortfall currently ! [The SA grid needs more POWER (600+MW). for long periods of time ..12+ hrs at a time, often much longer. I very much doubt they need it for "12+ hours at a time." Look at the demand curve; it peaks once, and it's not anywhere near flat. Yes, I did. Most thermal plants are most efficient when run at or near full power. And at 2am, demand is very low. Recharging a BESS during those times both improves the overall efficiency of your generation stations and provides peak power for daytime peak loads. Yeah a lot of things these companies do now, especially AGL seem to be about limiting supply, just like how AGL are going to shutdown Liddel power-station and are refusing to sell it to anyone, they are going to shut it down and demolish it to ensure no one else can use it. South Australia's imports as much as 30% of its electricity via the Victorian interstate grid, which is an extraordinary amount to rely on from another state, all depends on the weather how much they will import from Victoria. Came across these articles in Denmark (the home of windturbines) where the locals are fighting to stop them being built as they are noisy, alienate the locals and cause stress. While I have seen such articles all over the world, there is a guy in Australia who just released a book on the subject Simon Chapman who claims windfarms causing health issues is a bunch of baloney and he even says he traveled to Denmark and everyone told them they have never ever heard of anyone having any issues living next to wind turbines. Jeez bill, get real and just look at the facts.. This is SA power gen and demand today. Typical except they probably had more wind than normal ! Notice their max gas thermal capacity (red)= 1 GW . At 2 am they are still importing power . I will let you work out how much surplus energy they produced and how much they had to import. Looks like they need more PV solar. You must not be aware of the Thermal Solar plan for SA. Another $650m or so, for a 150 MW solar tower with 8 hrs of storage. ..except in winter when there is not enough sun to run the plant at all !! Truely a "World Class" dumb idea ! Solar pv with a Westerly set would help 14:00 to 18:00. The other two peaks at 07:00 and Midnight are a problem. I assume peak demand would be much less in the Winter. The big issue in the whole discussion of SA is that they are shutting down carbon generation without first having replaced it. And no availablity for economic growth. It also appears that the major populations in Victoria are quite a ways from the good sun in the interior. 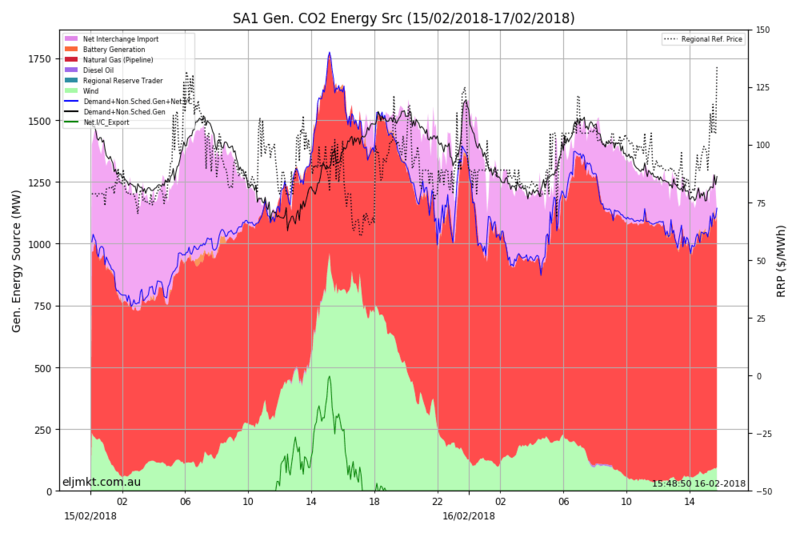 The big issue in the whole discussion of SA is that they are shutting down carbon generation without first having replaced it. I think that's a fair assessment. Like I say, it's a local political issue but Hillhater uses it to assume RE cannot work anywhere on the planet. What's the probable cause of the demand spike at midnight? Seems a bit strange. Maybe these are timed loads to take advantage of what would otherwise be the start of the low demand period? The storage would allow the thing to continue supporting the peak evening demand and possible even the early morning one. It obviously wouldn't need to run all night when there's little demand. Similarly it wouldn't need to run during the winter when there's little demand for air-conditioning (which seems to the problematic demand in S. Aus.). What's the probable cause of the demand spike at midnight? Seems a bit strange. Maybe these are timed loads to take advantage of what would otherwise be the start of the low demand period?.. ....yes , its the old 11pm, "Off Peak" timer meter for water heaters etc. ITS NOT a PEAK demand problem !......Its a generation shortage that is the issue. Say 8x150MW = 1200 MWh per day at best....which would be 440 GWh per year absolute max. A similar priced (Your fugures) 150 MW coal plant could supply 24/7, or 1300 GWh per year if needed. So which is better value . PS... In winter the commercial demand remains and the domestic switches to heating. Cool. Then if all you need is generation, then install a lot of cheap solar. However, I think you will find that peak demand still matters. And do what for the 18 hrs the sun is not shining ? I guess you dont bother looking at data graphs posted ? ...if you had , you may have noticed the continual power import during the night. Solar and wind advocates refuse to accept the concept of "Base load" ...the simple fact that most utility grids experience a demand minimum that is never exceeded, with normal operational demand always higher than that base level. Its a generation capacity that must be available 24/7. Of course , that reality does not work well with sources that are either totally intermittent (solar) , or highly variable (wind). And throw in the unpredictability factor for both, then you see why a continuous Base load is a concept they would rather argue against than accept. BESS, Solar Thermal, Pumped Hydro, etc etc , have all been proposed as substitutes to "time shift" stored power and even out the supply variations, but its becoming increasingly obvious that none of them are viable solutions on a national (or State) scale utility grid. Gas was cheap here until the export marked exploded - now it's getting rather pricey. Natural gas producers would rather export it for better margins. As a result, domestic gas has gotten rather expensive - at least as expensive as heating your home with electricity. In Victoria it's cheaper to heat your home and cook with electricity than gas. The proposed solar thermal station planned for South Australia is claimed to have a capacity factor of about 30%, which is rather good considering its challenges. I do agree with Hillhater though, that it's a hell of a lot of money to spend on a 150 MW peak generator, but at the same time I am excited to see how it pans out. It might have been better to build a PV+Battery system for the same or a bit less money, and have the benefit of being able to accept power from all forms (wind, PV, arbitrage). Amazing the climate similarities though between the southwest and most of Australia, but a stark difference in energy mix. Only places I can think of electricity as a cheap heating source is where Hydro is plentiful. both renewable and fossil fuels/nuclears have benefits.what we can do? Also there is less daylight hours for any rooftop solar to harvest power, and a longer period for lighting requirements. So whilst these is still reduced electricity demand in winter months, its not a defined as it used to be. California had a sunny day again yesterday. It's interesting how flat the peak from solar is shown. Flat accross from Noon to 18:00. And how much they can vary the hydro. Very poor wind again though. NY cruises along 16 GW at 200gm/ kWh with 50% hydro and nuclear. Germany had good sun and wind yesterday making it down toward 300 gm/ kWh. Today, not so good. And the data just now dropped out! I hope it comes back. Looks like all of the solar and wind build out in India is in the North West Gujarat area. South Australia had a good day with 20% of 1.5GW from solar at noon and now the wind is finally whipping with 500MW out of 1.5GW installed. I think you're starting to lose track of your own arguments. Right. And for now that will be met with conventional generation. That will slowly change with time, as storage and conventional renewables expand. In 20 years, a significant amount of our power will come from time-shifted intermittent renewables. ..In 20 years, a significant amount of our power will come from time-shifted intermittent renewables. Utility scale ?... Using exactly which forms of storage do you believe ? Before that "dream" materialises, i suspect we will have much better options for base load generation. Until then, we better make the most of our fossil resources. Yes with Germany it does have these long multiday dropouts. Its been grey color for about 24 hours now? While I can see the previous hours it was grey about this time yesterday when I looked at it. I don't understand how they can't supply their data, even much poorer euro countries like Latvia/Lithuania etc can provide their electricity data 24/7 but Germany just can't do it. And it always seems to happen when the wind is dubiously low, I know it seems just too silly to accuse Germany that they are pulling their data when it looks really bad on wind but so far it always seems to go out on bad days. England is at 4% wind right now and Italy about the same so not a lot of wind around Europe atm I guess. 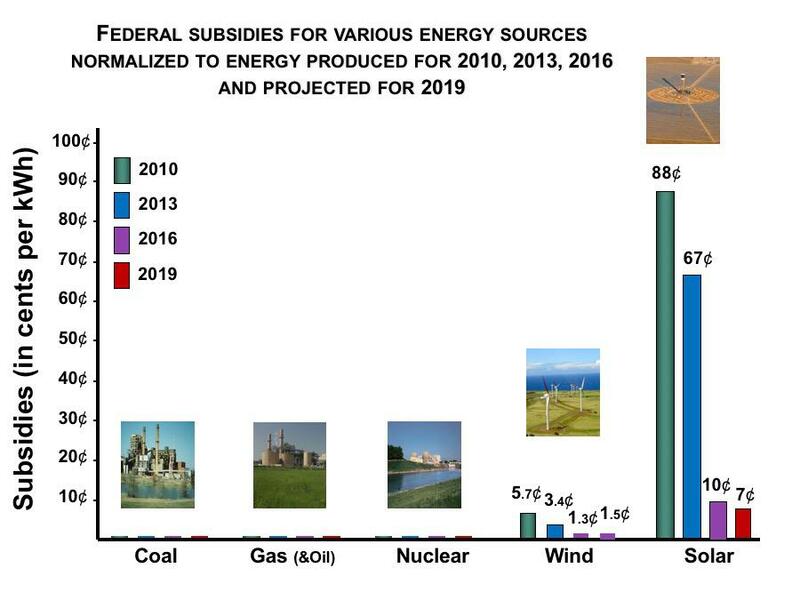 Until they do away with subsidies to an even level across all energy these claims that renewables is cheaper thus better than conventional energy will continue to be a bunch of baloney to me, because if it's that great then it doesn't need taxpayer help. With South Australia and their taxpayer helped Tesla solar+battery system I was thinking about how much Cobalt has gone up, apparently, its like $4,000 worth goes into a Tesla car at the $80,000 a ton mark for Cobalt. So the question I ask, if its all so "renewable" then why is the price to make this stuff going up on price so much? Because its not renewable. Unlike Hydro-electricty which is very abundant constantly being recycled water cobalt gets locked up into batteries and before Tesla has really even begun making a difference the price is starting to kill it, so it highlights just how lacking it is in renewables. Just checking out some of the ultra-potent green house gases emitted from solar-panel manufacturer and they are still rocketing higher, just grabbed this live from NOAA. And its not hard to calculate that these single handedly out do most countries entire co2 emissions and of course can't be absorbed by trees and will be in the atmosphere for 100s to 1,000s of years.